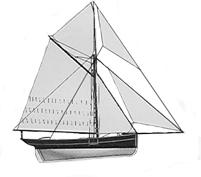 One Designs, Keelboats and Vintage Dinghy Classes at: Dinghies & Keelboats. The Albion (built at Oulton Broad in 1898) is the last survivor of hundreds of trading wherrys that plied the Norfolk and Suffolk waterways. They were barges of a very special type and their origins go back to the seventeenth century, perhaps earlier. A few were still active in 1939. 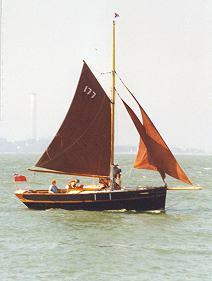 The trust was formed in 1949, bought the Albion, restored and re-rigged her. With the Trust she traded for about three years. She is very active but not trading now. Members of the Trust meet for day cruises and at social functions and Albion is also available for charter, for larger parties or corporate entertainment (with Skipper and crew of course). The Dunkirk Little Ships have a number of events - the cruise to Dunkirk every five years and an Annual Commemorative Cruise at different venues each May Bank Holiday. About 150 boats active. See also: Dunkirk Little Ships Trust. Bridlington Sailing Coble Preservation Society. Cambria has returned to active duty She was of course the last of the Thames Barges to trade actively under sail, and many of us remember her skipper Bob Roberts. "Barnabus", a 40ft St Ives Mackerel Driver built in 1881 at St Ives and now based at Falmouth. 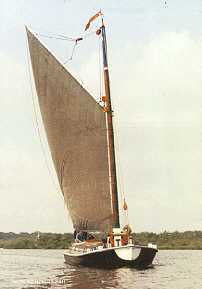 "Barnabus" carries her original dipping lug and is in sail. She is one of the few survivors of the original fleet and it is thought that here might be others on the far side of the Atlantic ? "Softwing", a Truro River Oyster Dredger built in 1900, engineless and qualifying as a Falmouth Working Boat. She is currently under restoration in Falmouth. The prime objective of the Union is to maintain and promote the European Yachting Heritage. One of its major roles is to act as a channel for the exchange of information between national classic yacht associations. Gaffers And Luggers Association (known as GALA), is an Owners Association for anyone with an interest in boats built by Gaffers & Luggers, of Tregatreath Yacht Yard, Mylor Bridge, Cornwall. All who have an interest in the products of Gaffers & Luggers are invited to join; it matters not the size or type of boat in which you have an interest… from the 9ft rowing punt through to the 46ft St.Malo Pilot Cutter - all are equally welcome! GALA aims to generate communication and fellowship amongst all members, and we also provide a "Questions and Answers" service, on any aspect of members' boats and sailing techniques, via our excellent Newsletter and e-mail. We also hold our annual AGM and social gathering at a convivial harbour-side location, somewhere in Cornwall . Members can purchase GALA Pennants/Burgees, clothing, and various GALA publications. Heritage Afloat is an organisation which gives national voice to all who are helping to preserve ships and other aspects of Britain's maritime past and waterways. Heritage Afloat aims to represent dozens of historic craft being preserved in Britain. These include nearly 50 large vessels, (over 200 feet / 60+metres, mainly static preservation), over a dozen working coastal steamships and the large number of sailing barges and traditional gaff rigged craft. Many preservation groups are corporate members but Heritage Afloat also welcomes individual membership either as an historic vessel owner (Personal) or supporter (Associate). Register of Expertise and regular Newsletter. We are actively involved in the conservation and restoration of the fleet of paddle-wheel steamships. Formed in 1963 the OGA actively sets out to preserve interest in gaff rig and to encourage its development in modern times - the OGA is certainly not only interested in old boats, members own modern replicas and newly designed craft. Neither is ownership of a gaff rigged boat essential for membership of the Association, which is open to all who are interested in sailing, building, restoring, or simply admiring gaff rig and other traditionally rigged craft. Membership is organised in twelve areas in the UK and there are branches in France and Western Australia - and has members in Europe, Scandinavia, Canada and the USA. The Association keeps in touch with its members through rallies and races, through its area newsletters and through its quarterly newsletter, the "Gaffers Log". 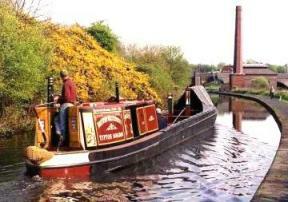 Sagitta is an historic working narrowboat now fully refurbished with her (unpowered) butty boat Carina. 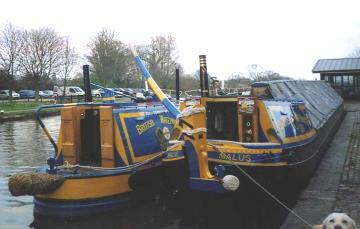 This Staffordshire pair will link up with town festival and waterways events throughout the region. The SSA was formed in 1991 to "represent and protect the interests of owners and users of smacks - defined as ex-working sailing fishing boats" SSA is affiliated to the RYA and is a founder member of Heritage Afloat and maintains strong links with The Old Gaffers Association and others. SSA compiles a register of surviving sailing smacks and bawleys throughout the country and abroad and runs a free advertisement section within their magazine especially for vessels in need of restoration and good homes! SSA publishes its own newsletter/broadsheet and magazine quarterly which carries reports of festivals and races and an annual events list.. Membership costs £10.00 pa. (No, you don't have to own a smack to be a member, Ed.) The Association has its own SSA handicap system for East Coast Smack Races. For model makers a number of plans sets are available - see our Model Makers pages. One of the principal jobs of the Thames Vintage Boat Club is to record traditionally built craft on and around the River Thames. The club encourages members in restoration projects, and provides a meeting point for everyone who owns or is interested in these craft. The Club also runs the annual Thames Traditional Boat Rally at Henley - for details click here. social events, both afloat and ashore. There is also a Fens section. but are interested in the aims of the Association. Atlas, Leo, Swift, Sagitta, Carina, Scorpio, Malus, Nansen, Birmingham as well as the Piling Rig and the BCN Joey.